General Mantis Care – Praying Mantis for a pet! Praying Mantids have long been kept as pets, with some hobbyists having one or two, and some building up collections into the thousands of insects. It’s very easy to replicate the natural habitat of a Praying Mantis in the home, and with a few pieces of inexpensive equipment, you can put together a professional looking setup that generate great interest and even aesthetically pleasing additions to the home. There is much to be learned about these amazing invertebrates! Basic care of Mantids is fairly easy, but once you are done reading this highly generalised care sheet, you will want to check out the advanced care sheets and see if there are any special requirements for the species that you own/are interested in owning. Keeping a Praying Mantis as a pet is fun and relatively speaking, is not hard at all. But of course a Praying Mantis does need proper care to stay healthy and strong. It doesn’t really matter if you have bought your own pet Mantis, or if you found a Mantis in nature, most of them need the same basic care. The following points will help you in keeping your Praying Mantis happy and healthy! So the general rule is that the height of the habitat/enclosure is 3x the length of the Mantis, and 2x its width. So let’s say your Mantis is around 3-4cm in length, then an enclosure with dimensions of 12-15cm high x 6-10cm wide x 6-10cm deep is perfect, or, for example; anything around half a pint to a pint in size, including 24-32oz Deli pots, or a cricket tub which is also great at this stage too (figure 1). Figure 1. 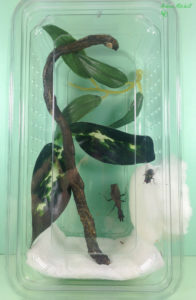 Cricket tub enclosure is a simple and adequate enclosure for a small/medium sized Mantis. You don’t want anything too big as the Mantis won’t see the prey you put in there, and might starve. For adult Mantids such as this one in figure 1 (Adult female Otomantis scutigera), the rule of 3x height no longer applies because the Mantis is an adult and as such has no more moults. With regards to foliage etc…well, it’s up to you. People who have one or two Mantids tend to make their enclosures as aesthetically pleasing as possible. This is purely for our own benefit of course, the Mantis couldn’t care less how pretty it is ha ha….. I suggest the odd piece of foliage as this might make the Mantis feel a bit more ‘at home’, not too much as to make the place look too busy though, and also, if there is too much, then prey will just hide, and your Mantis won’t see it, again, possibly leading to your poor Mantis going hungry. However, if you decide to keep a more ‘exotic’ species then you must research into the care of these Mantids from a variety of sources. If no care sheets are available, then research into the origins of the Mantids can be done so that an understanding of the natural habitat of that species can be achieved, and thus, recapitulated in captivity. If the room you decide to keep the Mantis in does not provide adequate heat then external heat sources will need to be used such as; heat mats, heat lamps or both. Please go here for an introduction into how to regulate the temperature of your Mantis enclosure. Place substrate on the bottom of the enclosure. This substrate can be anything that will absorb water and that will not mould easily. For example: tissue paper, vermiculite, potting earth, shredded wood, pieces of bark or sand. The purpose of the substrate is to release water slowly, thus keeping the humidity in the tank a bit more constant (see more specific care sheets for information regarding humidity requirements of your species of Mantis). To ensure adequate humidity, you need to spray the substrate at the bottom of the enclosure every day, or every few days during the week. Depending on the type of housing and on the species of Mantis you keep, you will have to regulate the humidity levels accordingly. For example, if you have more ventilation holes in your enclosure and your Mantis requires 60-80% humidity, then you will need to spray water more often to keep the humidity levels up. To understand more about humidity and how you can adjust it to suite the requirements of your Mantis, please go here. For example, a young nymph will only be eating small fruit flies such as Drosophila melanogaster or Drosophila hydei. Or, if they are a particularly small species, then even smaller prey such as springtails may have to be considered. Young nymphs of certain larger species such as Idolomantis diabolica however, can take green bottle flies or house flies immediately after hatching from the ooth. These young nymphs are likely to require feeding every 2-3 days due to the fact that smaller prey have a lower nutritional content than larger prey items, also, young nymphs tend to be much more active and as such, require more energy. A general rule is that until the Mantis reaches at least 5th-6th instar stages of development, the size of the prey given is not to be more than half the size of the Mantis itself. Older adults of pre/sub and adults can tackle prey 3/4 its own size, with larger species being capable of taking prey their own size. All this is dependent upon your objectives though, things such as how fast you want your Mantis to develop and whether you want to fatten your adult female before breeding and/or for ootheca production by gravid females will dictate how often you feed your Mantis, and also, the size of the prey you give them. When feeding your mantis, make sure the mantis will actually eat the food you offer it. When you introduce live food to the enclosure of the mantis, this food can hide or escape. When this happens often the mantis will starve. To make sure your mantis will eat what you offer it, you can watch until he has caught the food. You can also offer the food with tweezers directly to the mantis. If you do this carefully the mantis will grab the live food item directly from the tweezers and will start eating instantly. Prey that moves a lot, like flies, will generally be caught much more easily then prey that hides, like roaches or crickets. As is the case with yourself, I can’t emphasise enough the importance of a varied diet for your Mantids. Only feeding them one type of food item is not the most ideal situation to maintain a Mantids health. If you can, a diet made up of a variety of flies (blue/green bottles), hoppers (young locusts), adult locusts for larger Mantis species, roaches, meal worms, morio worms, wax moths and other prey items available is ideal. However, I appreciate this is not always possible, so if you can only feed your Mantis one or two prey items, then it is important to gut load them with the appropriate food items in order to maximise the nutritional value of the prey. Examples of gut loading includes; a mixture of honey, water and bee pollen for flies, whilst for roaches, worms and locusts, fresh fruit and vegetables are perfect. Mantises aren’t the tidiest of diners, and they’ll leave behind all manner of debris including legs, wings, chewy or hard bits they didn’t like such as stomach contents etc., and you need to remove these regularly to prevent mould/bacterial growth that will infect and/or kill your Mantis. Also, it won’t smell or look very nice. When cleaning the enclosure of your Mantis, just remove all the substrate and wash the inside of the enclosure with hot water. Do not use any detergent as this can harm the Mantis. Dry the enclosure and add fresh substrate and any cleaned foliage you may have taken out. Very informative great, I have ordered some dead leaf mantids from yourself when I receive them will they be able to handle small-medium crickets? They would be able to handle them yes. But to be honest, i feed them on large fruit flies until they are 3rd instar, then i feed them green bottle flies. So i have no idea if they will want to eat the crickets or not. I hope they do, good luck.